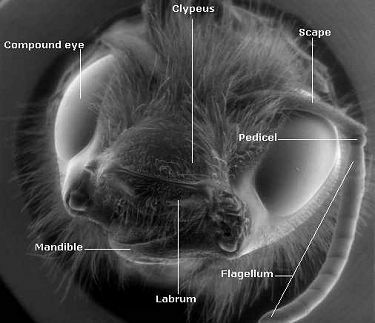 Below you can see the various parts of the bumblebee head. 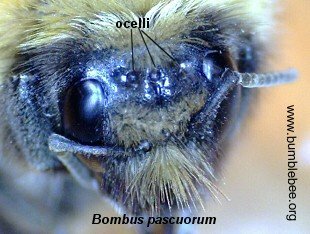 More information on the compound eye and ocelli can be found on the eye page. The mandibles are closed in this image, so the tongue cannot be seen, more information on the tonge can be found on the tongue and mouthparts page. The tongueis held within a horny sheath and folded lengthwise underneath the body. 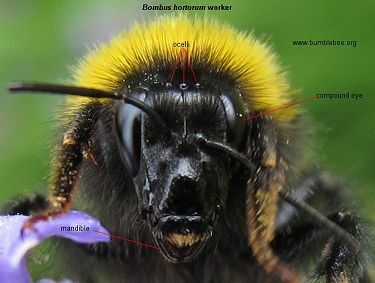 Note the difference in length of the face of the Bombus pascuorum worker and the B. hortorum worker below. Hortorum has a much longer face enabling her to push her way further down into narrow flowers to get at the nectar other bees cannot reach. 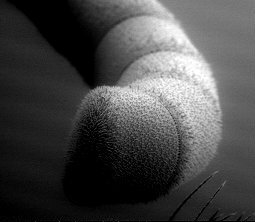 Above and below you can see an SEM image of the entire antenna of a worker, with the long scape, roundish pedicel followed by 10 smaller segments that make up the flagellum, the worker and queen antennae are the same, but the male has 11 segments in his flagellum. Taste and smell are conveyed to the bee through the tiny hairs on the antenna and mouthparts. The scent molecules pass through the tiny pores on the pore plates (see below), then stick to receptor sites on the sensory cells. The pore plates are also involved in the sense of smell. It is the great good fortune of humans that, by an accident of evolution, we and bees find the same scents attractive. 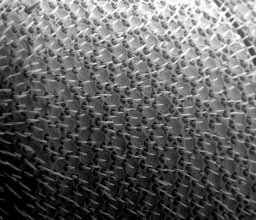 Above is a more magnified image of the end segments of the antenna above, and below, showing just the final segment you can just make out the pore plates. The pore plates are so-called as they are flat, slightly concave, and have a ring of pores around the edge. It is through these pores that the scent molecules pass to reach the sensory cell membranes beneath the plates. Each of these sensory cells is attached to the dendrites of nerve cells. And it is the electrical stimulus of these nerve cells triggered by the scent molecules that is passed to the bee brain. The bees can detect the direction of the smell as they have two antennae. We have binocular vision to help us tell how far away an object is. With two antennae the bumblebee can monitor the concentration of the odour molecules and decide whether to move towards or away from the source. Click here for full size image of pore plates. In common with many other insects, e.g. beetles and ants, the bumblebee has a pair of antennae cleaners on each front leg. The antenna is inserted into the notch then the metatarsus is bent enclosing the antenna. The antenna is then pulled through the notch and any debris or pollen is caught on the comb fringing the notch.